I am a huge beetroot fan, in fact as a child my Granny used to give me a can of beetroot as a treat every time I visited her. I have continued this tradition, though I now prefer to prepare my beets myself. If you have a white pristine kitchen, this may not be the recipe for you – likewise if you are concerned about having pink hands, you may want to invest in some disposable gloves. It is worth it though, I promise! To prepare the beets, wash them very well, trim off the stems and leaves and set aside any leaves which are in good enough condition to eat. Peel the beets with a potato peeler (I have tried peeling before and after cooking and have come to the conclusion it is messy no matter when it is done, so just get on with it). 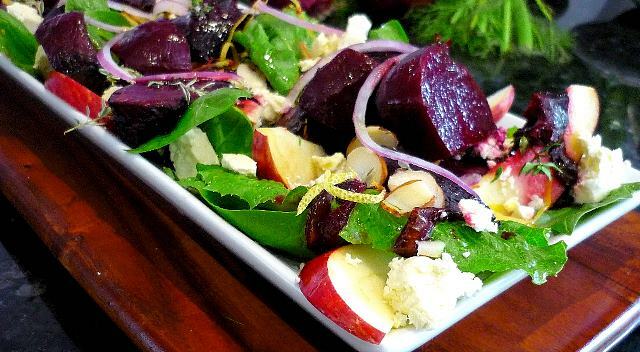 In a loaf pan or small baking tray nestle the baby beets together with the bay leaves and pour over the vinegar and oil. Add the juice and zest of 2 oranges, honey, the garlic cloves and the onion rings. Sprinkle over the salt, pepper, herbs, nutmeg and a little extra olive oil and bake in a hot oven for 30 minutes, or until the liquid has started to caramelise around the tender beets. Sieve the pan juices into a small bowl, add a tablespoon of balsamic, the juice of half an orange and a couple of tablespoons of olive oil. Add a few of the caramelised onion rings and check seasoning, if too sweet add more balsamic. 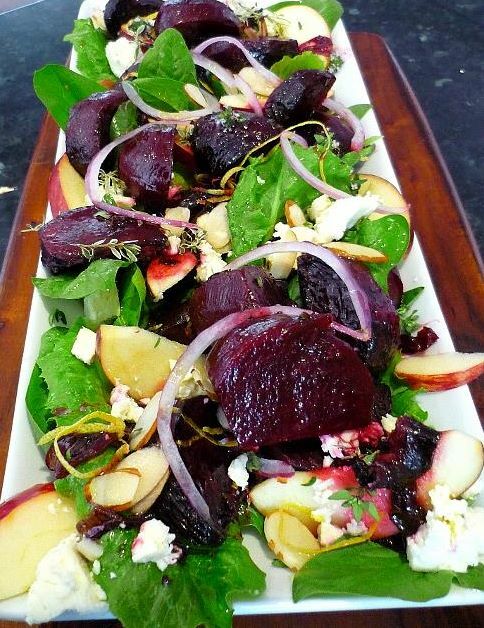 Can be served slightly warm, it is better to allow the beets to cool before assembling the salad though. 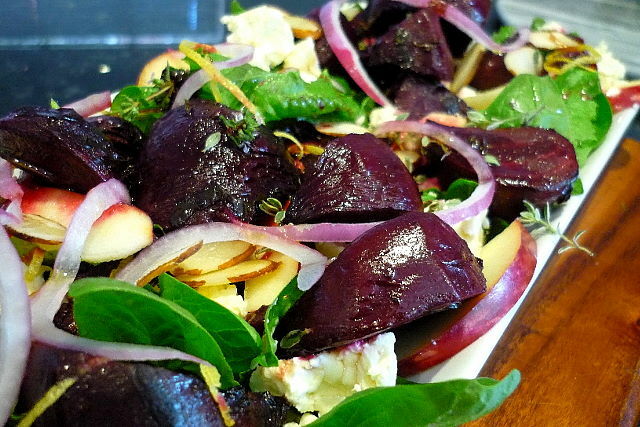 On a serving platter, lay out the lettuce and tumble in the beets. Sprinkle over the spring onion and crumble in the feta cheese. Add the apple slices, zest over the orange and drizzle over the pan-juice dressing. Lastly sprinkle over the pinenuts. This salad does not keep very well and should be eaten the day it is made. The beets, however will last for a week or more in their cooking liquor in a sealed container in the fridge.